This is my first post to my new blog. I never would have known how to start one without the help of Rita. She made everything for me on the front page. Isn't it beautiful? Thank you so much, Rita. I just love it! 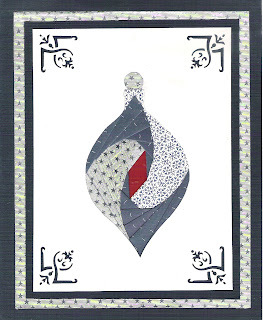 My first card will be an Iris Folded card. I love to do Iris Folding but it is time consuming. The pattern for this Christmas card is in the book Iris Folding For The Winter by Maruscha Gaasenbeek and Tine Beauveser. Hope you enjoy it.